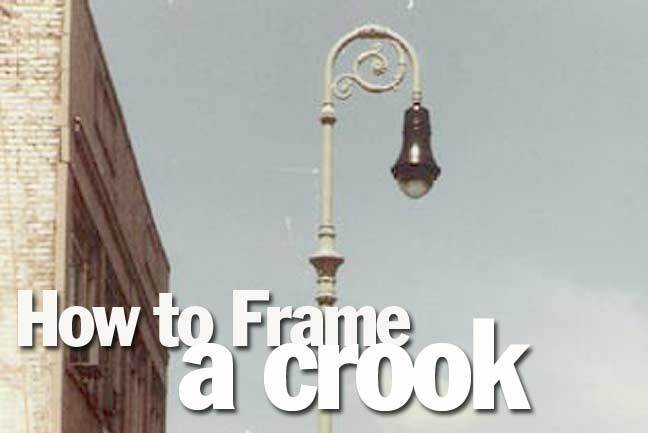 HOW TO FRAME A CROOK. 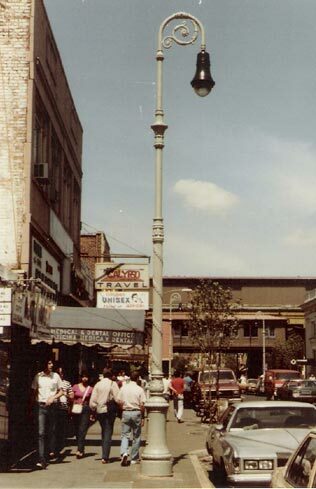 How the Department of Transportation defaced classic cast iron poles in the 1980s. 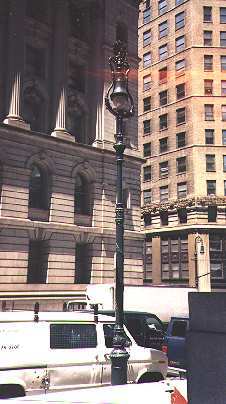 Before the days when the New York City Department of Transportation began to install replicas of classic bishop-crook, “Corvington” long-armed lamps and twinlamp designs, they defaced still-standing classic lampposts that were installed anywhere from 1892 to 1940 with bright sodium “bucket light” fixtures. 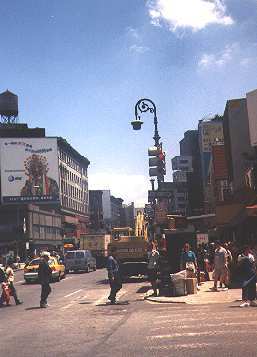 They were put there in the early 1980s to replace incandescent bulbs in an effort to make the streets safer, without having to tear down landmarked cast-iron poles. The technology exists today to retrofit existing luminaires with modern safe lighting (replacing the warm, but dim, incandescent bulbs they were installed with). 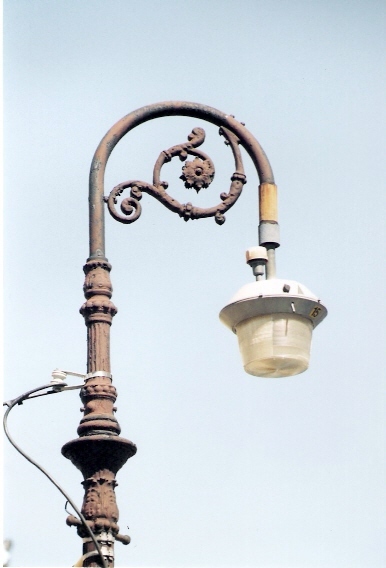 Nevertheless, there are still those awful hybrid cast-iron/ bucket lights still lurking around, and since they still qualify as historic relics, we’ll point them out right here. 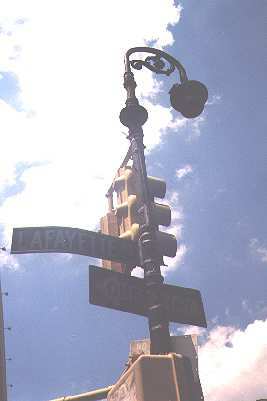 On the SE corner of Canal and Lafayette Streets is a Type 1BC bishop crook*, one of the oldest designs; it has a crossbar, made to imitate a ladder rest that the old lamplighter used to use on predecessor gaslights. The city, having already defaced this light with a bucket luminaire, is also trying to see how much stuff it can hang on a bishops crook without causing it to keel over. There are two large stoplights, two street signs, two don’t-walk signals, and a snow-emergency sign. 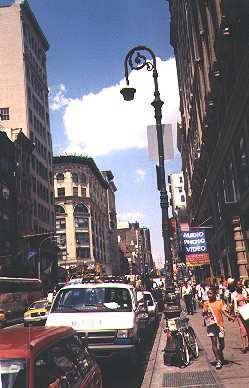 Given the amount of traffic on Canal Street, it’s a modern miracle how this crook has made it to 2001. 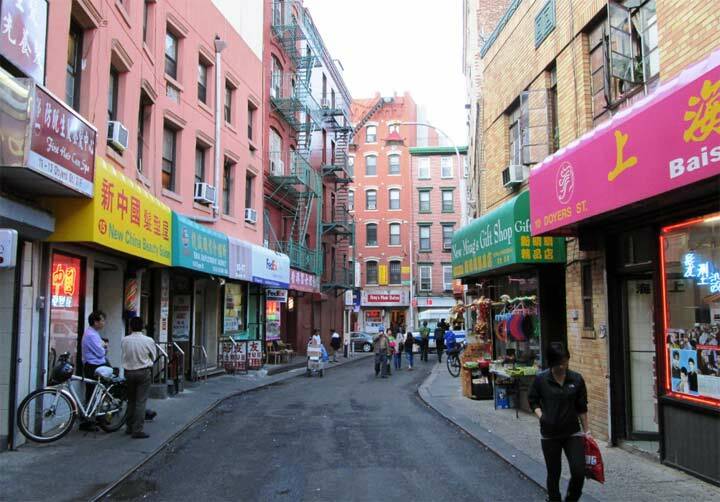 2nd and 3rd from left: Broadway, between Canal Street and Houston in Soho, has several examples of the Type 24A* crook…by far the most numerous of the many bishops crook designs that once dominated the town. Of course they have all been given ugly bucket type fixtures…. A remaining bucketed 1BC*, with “ladder rest” still in place, makes a nice accompaniment to the original NYC Police Headquarters on Centre Street (now Police Building Apartments), an ornate Renaissance Revival building finished in 1909. Left: Ho hum, we should be grateful that this post was even allowed to survive after 6th Avenue got octagonal poles complete with “Americas” medals like this one in the early 1960s. 2nd and 3rd from left: They may look new, but only the one on the left is. City Hall Park presents some unusual recastings of old bishop crook poles. 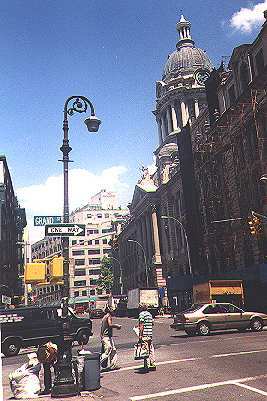 City Hall Park was rebuilt between 1996 and 2000, and while its collection of rusting cast iron Bishop Crooks was allowed to stay, it wasn’t without modifications. They were repainted and rebuilt, with new bell-shaped luminaires that are a good imitation of the ones that were standard issue on NYC streets from about 1938 to the mid-Fifties. They also received a new pendant design that also copies a design seen in some bishop crooks in archival photos from the early 20th Century. At the same time, a few leftover twinlamps were converted, and new ones, complete with pendants, were also built. 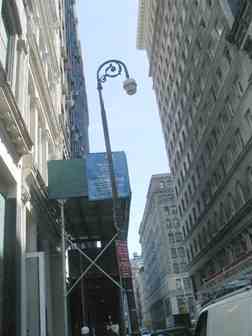 The pole shown at left copies a uni-lamped design that we’ve seen in archival photos of Times Square. 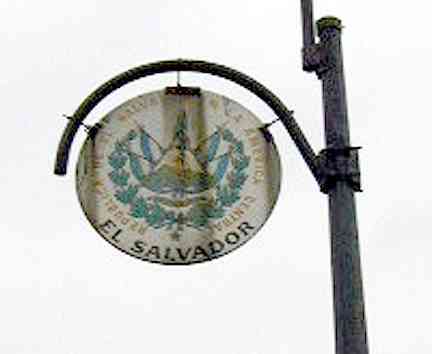 By the time the green-white mercury streetlamps with their octagonal poles began their invasion in about 1960, those poles were gone, but they have now been revived at City Hall. 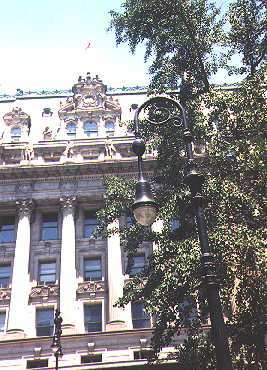 *Lamppost “type” numbers, such as 1BC, are those given in the 1934 System Electric Companies: Photographs of Street Lighting Equipment as of November 1, 1934, prepared by the then-Bureau of Gas and Electricity, which was a survey of all NYC street lighting in that year. 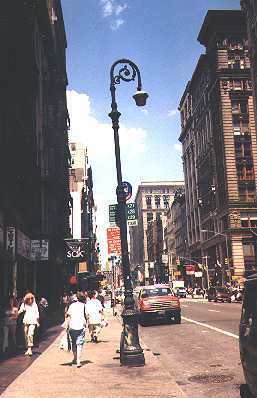 The booklet identified 76 types of cast-iron and iron lampposts, of which only 19 types have examples on NYC streets today!